Sometimes my kitchen is like a mad scientist's laboratory when I'm baking or trying out new pure vegetarian recipes — no eggs or dairy can equal a lot of trial and error (and time). So I figured there might be some of you out there who have never tried pure veg baking for this reason. With that in mind, do you have a recipe you'd like to Veganize but don't exactly know how or have the time to figure out how? I can totally do it for you if you send it to me. 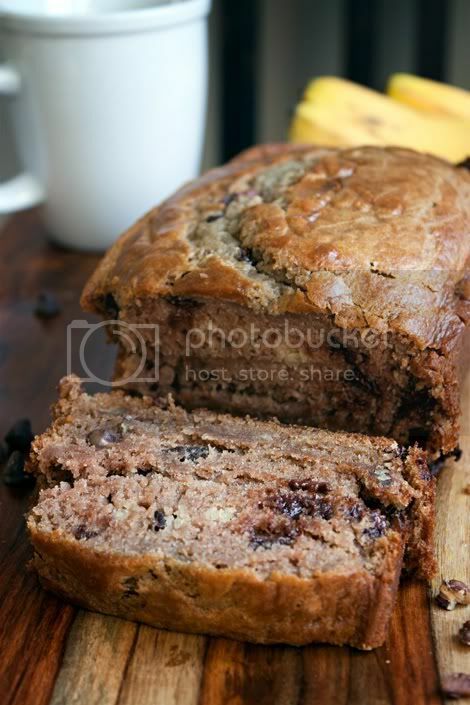 A few weeks ago I received an email from KV, who sent me a lovely eggless banana bread recipe. Except? The recipe did contain milk and butter, but I fixed that. 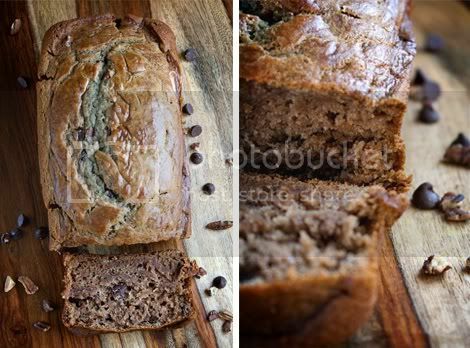 Below is the newly Veganized recipe for KV's Banana Bread. I added chocolate chips and chopped pecans to mine but adding chopped walnuts instead and omitting the chocolate chips would be fab, too. There's also a recipe for a crunch topping that I omitted when I baked mine but am including in the listing so you can have the option of making it for yours, or not. To start: Preheat the oven to 350°F and spray a loaf pan with nonstick cooking spray. Make the batter: In a large bowl, mix the pureed bananas, sugar, soy yogurt, Earth Balance, salt and flour, and mix well. Add the baking soda, almond milk and vanilla, and stir until everything is well blended. Fold in the pecans and chocolate chips. Pour batter into your greased loaf pan and bake for about 50-60 minutes or until a toothpick inserted in the center comes out dry. Remove from the oven and let cool in the pan for a few minutes, then remove from pan and allow to cool thoroughly on a wire rack. Mix the ingredients together in the same bowl you used to heat up the Earth Balance. Press the mixture lightly into the batter just after you've poured it into the loaf pan, and brush with 1 - 2 tablespoons slightly watered-down pure maple syrup before putting the loaf pan in the oven.